In terms of money. Relating to money. It is a right on a property, against transferring it to another person. You cannot transfer any property till it is free from encumbrance. Increased life expectancy has lead to the increase in the costs of living and medical expenses . This makes it difficult for many senior citizens that lack a regular income to live a life of dignity. Reverse mortgage is the solution introduced by the Union Government of India in 2007 helps senior citizens. Reverse mortgage is the opposite of a conventional housing loan that needs to be paid back with interest over a period of time. Reverse mortgage helps senior citizens having a residential property to receive a regular income against its mortgage. The borrower and his/her spouse are allowed to stay in the place of residence until both die, aiding the living of a dignified life by senior citizens. A senior citizen couple should necessarily own a flat or house. Then they can pledge the property for a monetary value agreed upon by the bank. The value is generally fixed considering the present property values, demand and also the condition of the property. The bank starts periodic payment as a loan that is decided after consideration of margin of interest costs and price fluctuations in the property. It is an ideal solution for senior citizens that have residential property, but no finances for regular day to day expenses and medical aid. The borrower’s interest in the property decreases once the reverse mortgage EMI begin. The maximum amount of the loan given generally as EMIs cannot exceed 60% of the property value. In addition the minimum period of the mortgage is 10 years, and maximum 15 years. However some banks have been recently offering tenure of about 20 years. The borrower can avail of the loan in parts every month, every quarter, every year or in a lump sum. The lender/bank would revaluate the property once in 5 years. If the value of the property has increased, the borrower has the option to ask for an increase in the amount of loan. He can also ask for the additional amount to be given in a lump sum. The installments or lump sum received in a reverse mortgage is a loan and not an income. Hence no tax is payable on it. However he has to pay capital gains tax when the property is taken for the borrower for the repayment of the loan on the mortgage. The interest paid on the reverse mortgage could be floating (fluctuating) or fixed, with this rate depending largely on the interest rates prevailing in the market. He/she is above the age of 60 and his spouse that is a co-applicant is above 58 years of age. The property is the permanent residence of the individuals and is self-occupied. The property should be self-acquired and located in India. The title should be clear of the borrower’s ownership. It is mandatory for the property to be free of encumbrances and it should have a minimum life of about 20 years. The reverse mortgage loan is payable on the death of the last surviving life partner. It could also become payable when the borrower sells off his/her property. In such cases the bank gives the choice to the heirs to settle the loan with accumulated interest. Otherwise the bank arranges to recover the same with the sale of the residential property. Any extra amount that remains after the loan with interest and expenses has been settled is passed on to the legal heirs. If the sales proceeds are much less than the loan, the bank. In case of losses that could occur due to wrong estimation by the bank is borne by them. The loan could be foreclosed when the borrower has not continuously stayed in the house for a year or has failed to pay property taxes or insure the house. The loan is also foreclosed when the borrower turning bankrupt, donates or abandons his property. In addition renting a part of the house, adding an extra name to the ownership could all affect the lender’s interests and lead to foreclosure of the mortgage. Government statutory provisions could also require it. 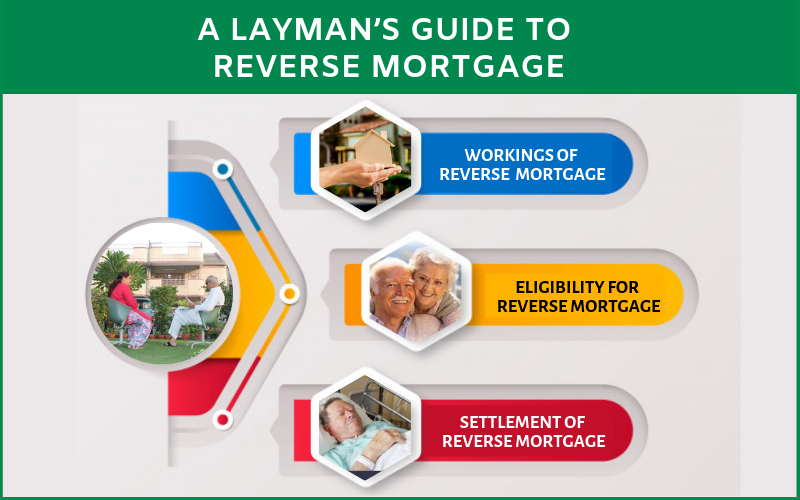 Some other highlights of reverse mortgage include the borrower’s option to prepay the loan with interest. Also one or both spouses could outlive the period of the tenure. Then the bank will stop payment of monthly installment. They will however wait for the both the borrowers to die before settlement. Reverse mortgage involve long, tedious, difficult and complicated procedures. In addition they have no provisions for increase in monthly payouts. Lastly reverse mortgage has failed to gain much popularity in India, with marketing strategies being inadequate. The reason is also that many banks are fixing the maximum limit of loan. The resentment among the heirs and family sentiments are also some of the other reasons. It is true however that reverse mortgage is the solution for financial sufficiency in lives of most senior citizens.